Storage Center (Compellent) Operating System version 7.3 became generally available last month. Its been rolling through the various stages of release all summer, and I now have some customers on it. There are so many improvements in this release that I had to take a moment to talk about it. This release probably should have been a 7.5, its one of the biggest updates we’ve seen in a while. The Web GUI is back! And its not Java anymore! A while ago, Dell did away with the old web UI that comes straight off of the controllers. That web UI had been hanging around largely unchanged for some time, and it was the source of many Java related issues. Those of you who have managed a Compellent in a Brocade Fibre Channel environment know the joy of trying to get both management tools working on the same system. 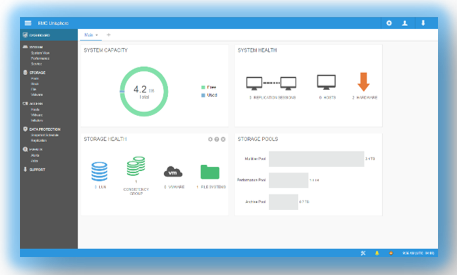 While the Web UI was gone, we had to use Dell Storage Manager, or DSM, to manage arrays. Well, now the Web UI is back, and its all HTML 5. The new UI has been rebranded Unisphere, to be consistent with the management interfaces for Unity and PowerMax. No more dedicated hot spares. The system can now distribute spare space across all drives. Think of it as virtual spares made up of the free space from all the drives. By default, the system will reserve 1 drive worth of space for every 20 drives. So, if you have 40 x 1TB drives, it would reserve 2TB of space across the pool to account for sparing. This is a great improvement! You’ll be able to take advantage of the IO capabilities of all the drives, instead of excluding hot spares. You’ll get much faster rebuilds, which reduces risk. This has been a long time coming. 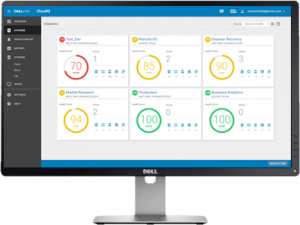 This is a SaaS based monitoring and analytics feature that provides a web portal view into your storage arrays that you can access from anywhere via your Dell EMC login. If you already have an SC or other modern Dell EMC storage array, you can connect it to Cloud IQ here. Through software changes alone, Dell EMC was able to wring 44% more IOPS out of the same config than on SCOS 7.2. This could represent 50,000 – 100,000 additional IOPS out of the same hardware you already have. While you may not need all those additional IOPS for your workload, it will also translate into the IOPS you are already doing will complete faster. This is almost like getting the performance of another tray of flash drives without buying anything. Increased maximum capacity across the board. Now up to 6PB behind a single SC9000. The new version of DSM is HTML 5 instead of Java. Nice! Live Volume ALUA – this is a really cool enhancement that deserves its own post. Support for 25G and 100G iSCSI ports. Check out this video from EMC with some info about SCOS 7.3. This was a pretty major update huh? Let me know what you think in the comments below.